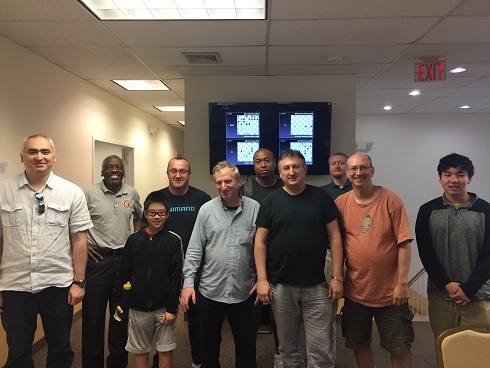 This year’s tournament continued its reputation of begin the strongest tournament in Connecticut with six grandmasters participating in the top section that, as usual, also had an incredibly high average rating of 2431! 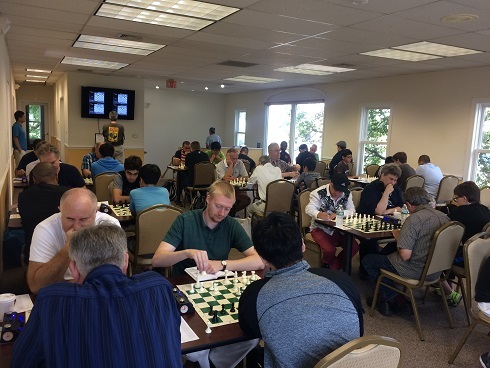 As we saw with last year’s event, anything is possible in a five round tournament where nearly half of the participants are grandmasters. With a strong performance it is possible for any of the dark horse players to make a run at first (just ask last year’s winner FM Leif Pressman). 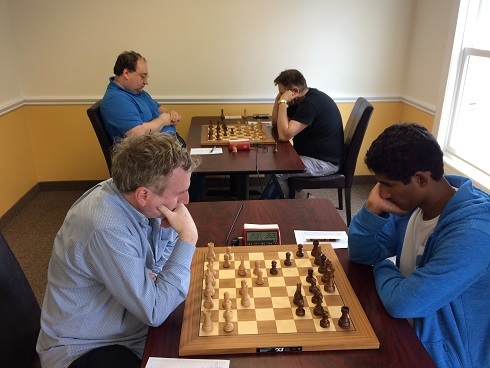 This year the upsets began early with FM Kapil Chandran’s round 1 win against the top seeded GM Giorgi Kacheishvili and FM Boris Privman holding GM Sergey Kudrin to a draw. However, that was the extent of the upsets going forward as most of the results went as expected. Going into the final round GMs Joel Benjamin and Michael Rohde were tied for first with 3/4 each. Their final round draw allowed GMs Giorgi Kacheishvili (who rebounded nicely from his first round loss) and Maxim Dlugy to catch them in a four way tie for first place. Each winner received $250 for their efforts! The class championships section was no less exciting. With so much on the line there were many uncompromising games. After three rounds only Mikhail Koganov, Jacob LaPlant and Charu Robinson were tied for the lead with perfect 3/3 scores. 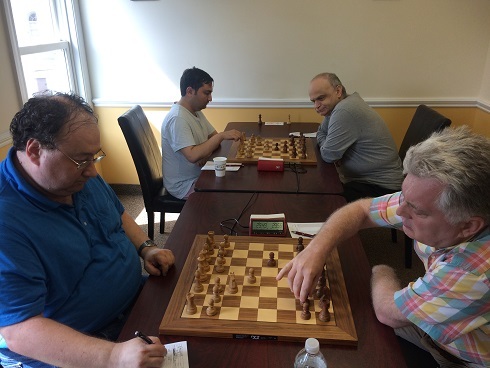 Koganov and Robinson faced off in a critical board one battle that ended in a draw. Meanwhile, LaPlant faced off against second seeded Eric Zhang who was trailing by just a half point and was unable to maintain his momentum. The most important match going into the final round was the marquee match-up between the top two seeds, Koganov (3.5) and Zhang (3), while Robinson (3.5) faced off against fellow expert Alex Eydelman (3) who was in a must win situation for a chance at first. 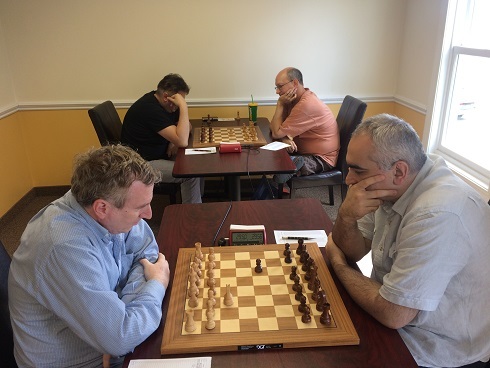 Robinson v. Eydelman finished in a draw, while Zhang managed to over-power the other tournament leader to leapfrog into a tie with Robinson with 4 points. Earlier leader Jacob LaPlant and Slawomir Naumowicz also won important games to catch the leaders in a tie for first. In addition to the outstanding results by the tournament winners, there were many fine performances in the class section. Alexander Kupersmith (1719) nearly managed to win his final game and get a share of first. A last round draw was still good enough to give him the U1800 prize of $100 all to himself. Rene Munoz (1545) and Richard Zhu (1219!) tied for the top player U1600 with 2.5 points each. Zhu picked up nearly 100 points for his heroic efforts in the last two rounds. Thank you to everyone that came out to participate in another outstanding and memorable event. We are already looking forward to next year!